I’m really digging Balto right now. He may be my spirit animal, I mean, if a guy can name his own spirit animal? I just don’t know. I don’t know if there is such a thing, but if there is, I take Balto. In 1925 Balto saved the town of Nome with his bravery, resilience and intelligence. Not to mention his endurance. He had a wonderful master, but He disobeyed his master in order to save everyone. Its a religious thing for me, the feeling of love and admiration I have for things like this that exist in the world. And unlike humans, dogs don't look for riches or admiration, just a feed and a pat.True champions. I was born in the year of the dragon, but I believe the snow dog is my spirit animal. Does that mean anything? I don't know but I was born in the year of the rabbit, and I love hunting them with my whippets and terriers.I think its what you feel a connection with,so its up to you imo. It relates to your personality. "Guardian Spirits" are "Thought Forms" created by your subconscious. Independent, yet part of you. I don't have a Guardian Spirit. But I do have a "Totem", which is the mountain lion. I was born the year of the Monkey. I have personality traits related to it. But it is not related to my Totem. Watching those whippets run must be a blast. 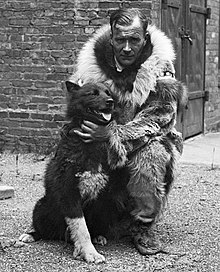 This is a picture of Balto with his musher Gunnar Kaasen. It's an amazing story of this team getting that medicine to the town through one of the worst blizzards on record. The short story is better. But, Balto had to rely on his sense of smell and direction to get them back because they couldn't see. It was complete white out. Every hunter over here hunts pigs,which I do at times but my passion is hunting rabbits with ferrets and whippets,also rats and foxes with Russells.Watching the whippets work is like poetry.The bigger blue/white one is the best hunting dog I've owned. Beautiful animals. You obviously keep them lean and fit for hunting. I would love to accompany you on a hunt one day, but I'm half a world away, so that will never happen. You ever come over your welcome.Should get yourself a couple,I hear the jack rabbits are good to run there,I think they are more like hares than the European rabbits we have here that live in warrens.Yeah they get plenty to eat but are run daily on my farm,just their normal build,a bit different to the show type. Thank you. And I want to say, I did not mean to imply your dogs are too thin, or not fed enough. Your dogs look awesome, and that is what they are supposed to look like. In fact, please post pictures of your terriers. No worries,I just put the weight thing as I'm used to pet dog owners saying they are too thin when they are super fit.Sorry can't seem to get pics of the terriers up,They go up ok on a couple of hunting sites I use.There's hardly any people in OZ that have working terriers or running dogs,mainly an English pursuit.I could pm you on the site with pics of my dogs if you like. https://resizeimage.net/ This is what I use to get pics to fit here. Yes. I understand and I’m sorry if it seemed that I implied otherwise. You are 100% correct. This is what whippets are supposed to look like. I know this because I had one. your dogs are perfect and the other people don’t know what they’re talking about. You don’t try to put weight on a cheetah. You can only download from files on your hard drive. When you hit the "download image" button your files should open up. I make my life what it is, and if you judge me for that, then you don't have a life at all. I was born in the year of the monkey. I don't like monkeys and apes. I discovered on the last full moon that my spirit animal is a silver Wolf. Anything could be.